We love all kinds of mobile and manufactured homes here at Mobile Home Living. So, when Violeta and Dylan asked us if we would be interested in sharing their overhaul of their 2005 Forest River Sierra, of course, we said yes! They are now Living the dream in a “Gypsy Caravan”. 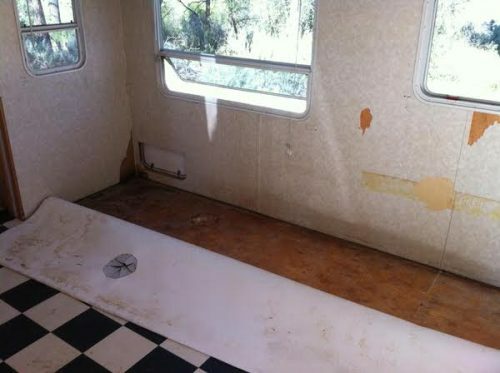 Related: Affordable DIY Vintage Camper Renovation: Adopting Shana The Shasta. Violeta and Dylan who are both talented and creative people, met while they were both traveling the world, and married a short time later. (You can read more about their story and adventures on their site The Sage and the Butterfly and see a sampling of their creations as well). For over 6 years they were settled in the mountains of California with their dogs. During a trip to Alaska, Violeta jokingly suggested they take their life on the road full time and Dylan jumped at the chance. The dream was born! Next came the search for the perfect home to make their life on the road a reality. 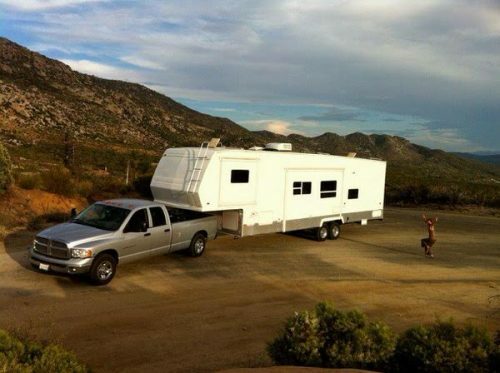 After an extensive search, they finally settled on a 2005 Forest River Sierra toy hauler trailer, which they lovingly named the “Gypsy Caravan”. Time for the real work to begin. First came the tear out of the interior, including furniture, wallpaper, and carpet. Some mild water damage and mold when the walls were revealed cause a little concern, however, bleach removed the mold and the water damage was minimal. 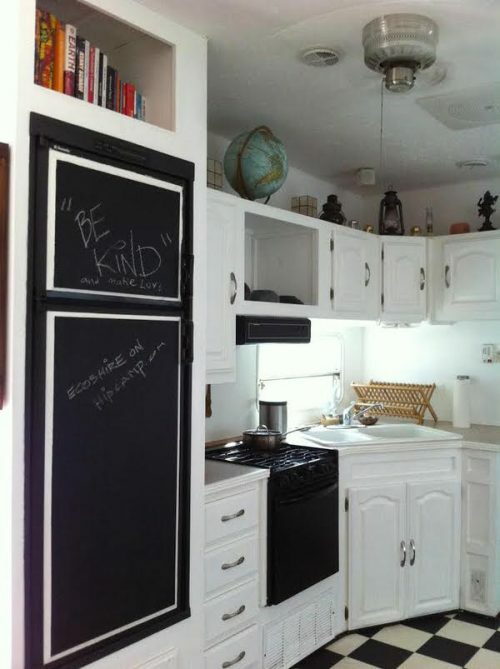 Next came a fresh coat of white paint on both the walls and cabinets in the living area. A nice faux finish late paint in an aqua blue sky color was added to the bedroom and bath. Violeta says the bedroom is nice and cozy, making it her favorite feature of their new home. 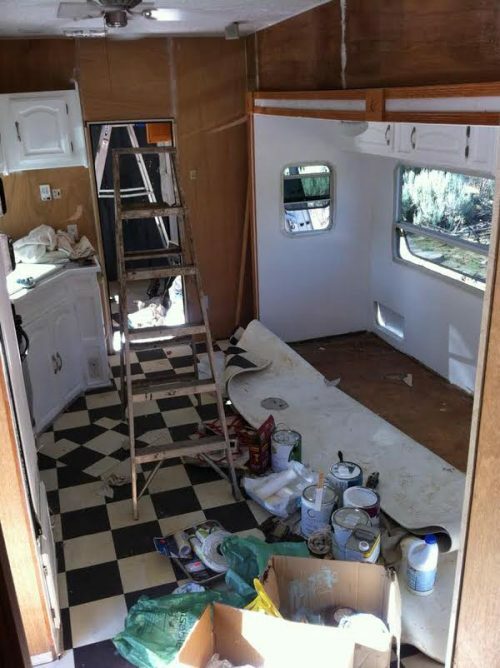 A look of the trailer during the remodel. 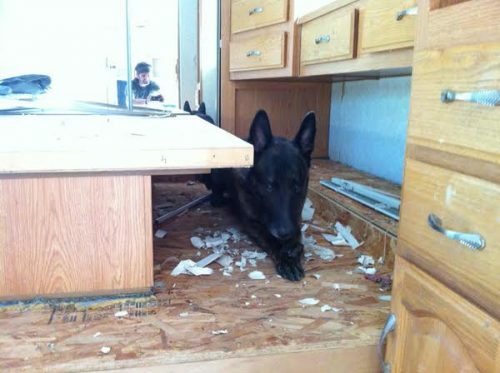 One of the dogs taking a work break! Some water damage and mold under the flooring. Next came flooring. 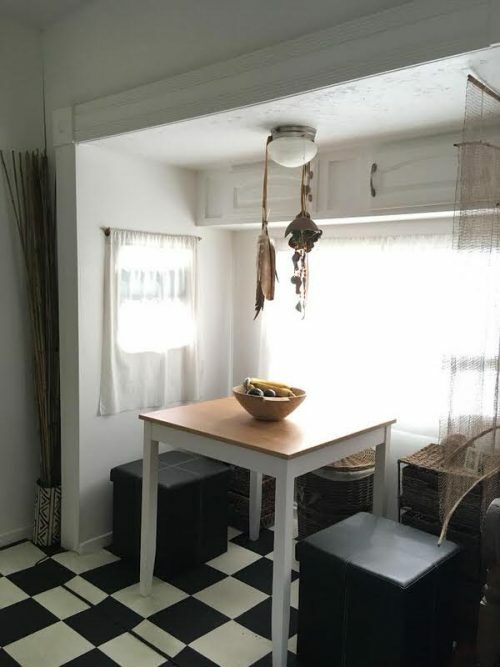 Dylan installed bamboo and recycled vinyl flooring in the bedroom and bath. 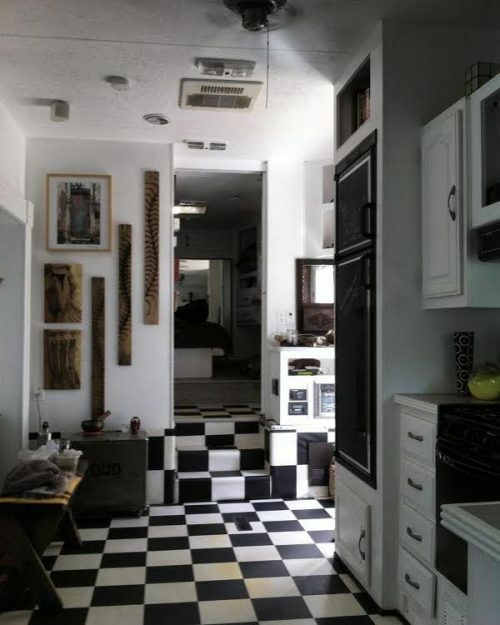 They decided to keep the original black and white checkered floor in the living/kitchen area. It compliments the retro feel they were going for. White walls really open up the trailer. The entire space flows together great. Next on the list was deciding what to do with the bathroom. Violeta and Dylan both firmly believe in living eco-friendly so they needed to do a little research regarding this. Finally, they decided on a composting toilet which took away the need for dumping the waste. 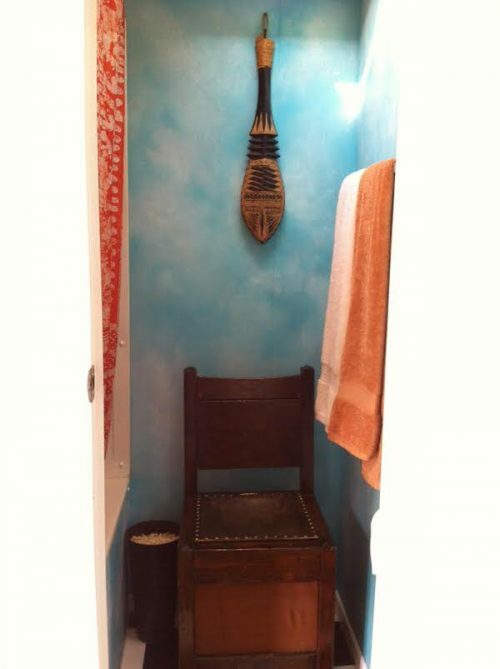 They used a vintage find from British Columbia as their “throne”. Then they decided to use Silk Sari as their shower curtain to continue with their retro feel of their Gypsy Caravan. 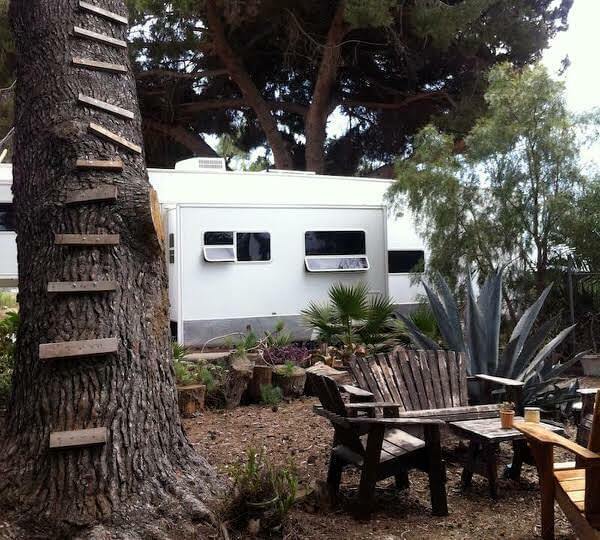 Solar panels were added to the trailer as another way to live eco-friendly. This was definitely the costliest addition to the remodel but definitely worth the price. The couple spent around $7600 on this part of the project. This included the solar panels, batteries, and inverter as well as a day’s labor to have them installed. The couple estimates the total cost of the project to be a little less than $10,000 not including the cost of the three months of time it took them to complete the remodel. However, in the end, being able to live on the road, visit family and friends and stay in new places makes the project priceless! The garage portion of the trailer is now home to Dylan’s workshop so that he can continue his custom razor and knife business while on the road. You can visit the sites to learn more: Classic Shaving and Sage Blades. 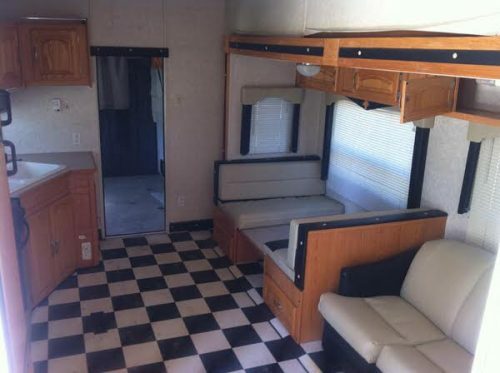 That’s definitely one of the perks of trailers like this, tons of room for life on the road! The Gypsy Caravan ready for her next adventure. We think the couple did a great job on their remodel. We are more than a little jealous of their ability to pick up and go where the mood strikes. They are truly living the dream in their “Gypsy Caravan”! What do you think? Comment below, we want to hear from you. Fantastic! How I wish we would have done that when we lived on the road for 14 years! Due to health and limited income we may be doing this too. Its a great life, even rough as we did it.